The staff was exceptional, attending to any requests immediately. From the moment they took our luggage ( I think it was Joe who was so great!) so we could check in, until the day we left. We will come again! It was a fun place to stay, close to the town square, music and dancing, bar/restaurant. Our room was above the music, we could hear the music in our room until midnight which was fine, we were so tired after a day of beach, walking, music, etc. Great location near everything. It's a party place with lots of entertainment. Can be loud, even in your room. Chairs and Umbrellas are not owned by the resort - 3rd party - ~$28 for 2 chairs for the day. 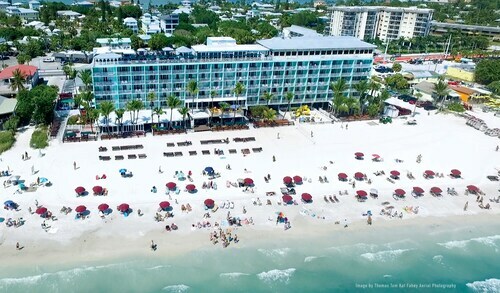 Great beach, meal options, happy hours, shops, entertainment on site. Pool side room on 3rd floor has great view of Beach. Room was clean but Damp. Great location to city square and lots of resturants. Park the car and walk everywhere. Very friendly island with reasonable prices. Loads of fun and awesome fireworks. The hotel was in a great location on the beach. The complimentary breakfast was very good. All the rooms have a private balcony facing the ocean. Standard room is a little small but has a full kitchen which was nice to have. The place was nice size. The pool was small and private. A plus. However, I he bar nextdoor had loud music most of the night. I would still go back because of the location and spacious room. I liked the access to the beach. The beach was cleaned each day by the staff. Did not like that the hotel did not have any umbrellas and chairs for their guests.A outside group wanted to charge $25 a day to use one. 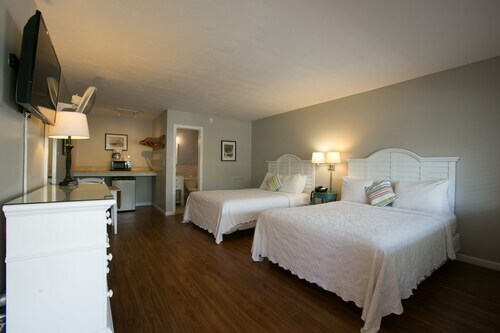 The location was excellent, the staff was extremely friendly, and it had every amenity possible! Why waste time thinking it over? Times Square was meant to be experienced. 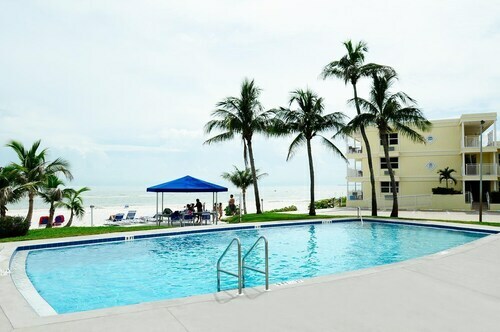 It's located in Fort Myers, a lively city that offers adventurers a broad range of exciting things to see and do. You'll be happy to know that there's no shortage of hotels in the vicinity of Times Square. With 25 candidates within an easy commute, finding somewhere to stay is simple. 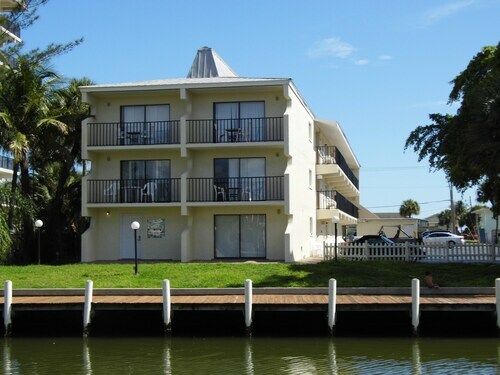 The Pink Shell Beach Resort and Marina is just 0.8 miles (1.3 kilometers) away. If that's not to your liking, the DiamondHead Beach Resort and The Neptune Resort are situated 0.6 miles (1.0 kilometer) and 0.7 miles (1.1 kilometer) away, respectively. 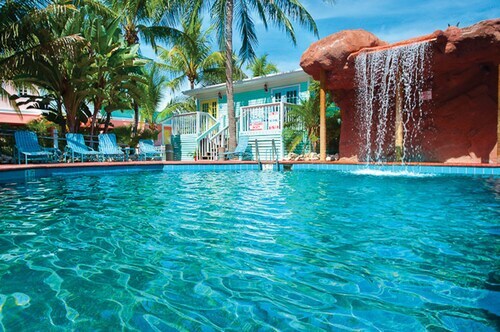 Make your money go a little farther by staying at one of the bargain hotels available here. 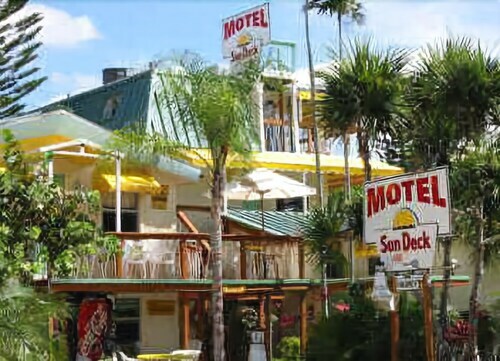 The Sun Deck Inn and Suites and the Pierview Hotel & Suites are two such places. They are 0.2 miles (0.3 kilometers) and 0.1 miles (0.2 kilometers) away, respectively. You don’t need to be a celebrity to spend some time at one of the high-end hotels that are in the surrounding area. 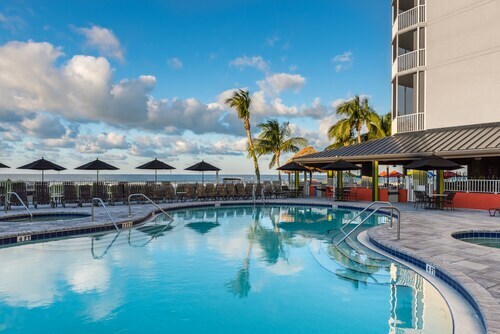 The Sanibel Harbour Marriott Resort & Spa and The Westin Cape Coral Resort at Marina Village are solid choices that are worthy of your consideration. For everyone who's finding it too difficult to pay attention to their to-do list, a piping hot coffee is never a bad thing. 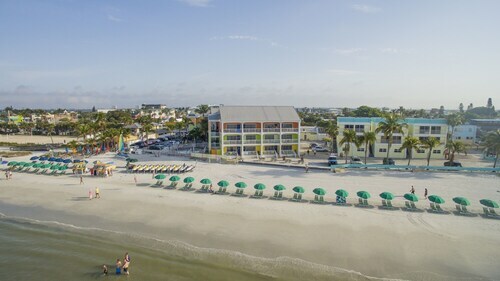 Just 0.4 miles (0.6 kilometers) from Times Square, Bonita Bills Waterfront Cafe (702 Fishermans Wharf, Fort Myers Beach) is a terrific option. If you want a bit more on your plate, Pete's Time Out (1005 Estero Boulevard, Fort Myers Beach) is an excellent choice. The Big M Casino always offers patrons a memorable time full of high-stakes fun and excitement. At Ostego Bay Marine Science Center you will find exhibits filled with fascinating creatures from our planet's massive oceans. Anyone who likes to get back to nature should enjoy the protected Bowditch Point Park. Bay Oaks Recreation Center is a popular recreation park that's enjoyed by locals and tourists. It's the perfect place to bring the entire family. Matanzaz Pass Preserve is an unspoiled site where you can have a walk, and maybe see some bird species. Hotels in Times Square start at $84 per night. Prices and availability subject to change. Additional terms may apply. Location/location, NO Road Construction, Easy On/off Island, Walk to Everything!